Max is a Marvel character who is the dog of the vigilante the Punisher. Max is an guard dog that was rescued by the Punisher, Frank Castle and used as a guard dog of his safe houses. The dog is massive and violent and terrifies almost everyone but Frank. The dog was initially a guard dog at Empire Check Cashing but a group of punks killed the stores owner. Max chased down the punks for blocks and through buildings. The dog kills almost the entire group with only two left alive, but before he can take him down the roof of the building he is on collapses. Max is injured and trapped beneath debris. 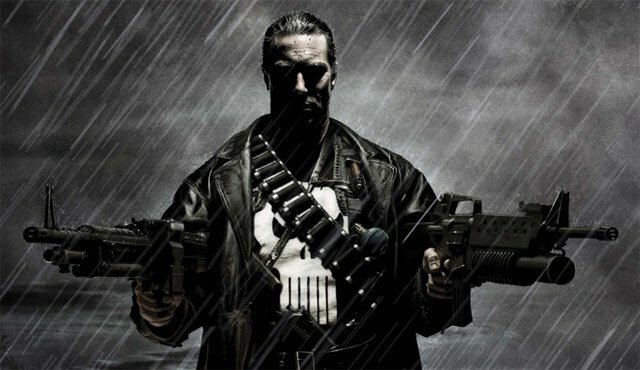 The Punisher sees this kills one of the last punks, then knocks the last one to Max who quickly ends him. Max has greatly endeared himself to Frank Castle for basically being a canine version of himself. As the dog had gone to the "Maximum" to take down the punks, Frank names him "Max". Frank sets up Max as a guard dog of one his safe houses. The dog has a collar that unlocks a doggy door specially designed for him. The door will not open for any other animal or person. "Max started off our relationship by tooth-testing my arm and leg. Luckily, we'd both had our shots. After we became more friendly, he still tried to get me; which makes me think he acquired a taste for me. You never quite knew where his rough-housing ended and his lethal attack began. ....Micro had a theory that I got him all these chew toys 'cause I liked him; Naaah, I was just hoping to tire his jaws before he got to me." The Safehouse Max is in is entered by George Wong an agent of the Kingpin. The two fight, and both break apart baddly wounded. Frank finds him and in a controversial panel pulls out a knife. It is unclear if in the panel he was putting down Max or performing surgury on him. Later, it is revealed that the dog is alive and Frank performed surgery on him. Max appears again in Punisher, Warjournal. Frank brings a police detective Lynn Micheals to one of his safe houses. There he shows the extensive level of booby trapping that goes into one of his homes the final guard of the house is Max. A gang called the Ghetto Rangers learns that the Punisher has entered in the house and decide to invade it. They hope to either kill the Punisher there or wait for him. The gang is largely decimated by a claymore, electrocuting light switch and other traps, the final few members are attacked and killed by Max. Max tackles the last one through the window. Biggs, the leader of the Ghetto Rangers gang is waiting outside and is impressed by Max, he knocks him out and kidnaps him. "They took my dog. I can't make them dead enough." Castle tracks down Biggs but learns that the gang leader was unable to train Max and traded him dog fighting operation in Jersey. A man named Billy began using Max in fights. He used a taser to keep the dog incapacitated when not fighting. Castle begins cutting his way through all of the dog fighting operations in Jersey. Castle breaks into a fight shortly after Max kills a dog in the fight. He shoots through the various dog fighters. The trainer Billy falls into the arena where Max attacks him and kills him. Max and Punisher both covered in blood reunite in the arena and Castle brings the big beast home. Much like his owner Frank Castle, Max has no super powers. He is just big, stubborn, vicious and all around mean. New pictures from JustJared a battered Frank Castle confronts a pair of thugs. Some have speculated they may have stolen a dog. Could this dog be a version of Max?